Unions across the country are striking around Costa Rica tomorrow. Here are some things you need to know. On Aug. 24, the High School Teachers’ Association (APSE) called for an indefinite national strike starting on Sept. 10, to protest a tax reform law currently being debated in the Legislative Assembly. All of Costa Rica’s public unions have joined the strike as well as some private sector unions. Those protesting tomorrow will include students, teachers, medical workers, telecommunications employees, municipal employees, and transportation workers. Unions also called on citizens to join the protests. The strike will center around a march starting at La Merced Park in western San José at 10 a.m. Protests and roadblocks are also expected across the capital, and there are regional protests planned around the country. An unconfirmed document circulating on social media named 30 key points where roadblocks are planned, including both airports, but Albino Vargas, Secretary General of the National Association of Public and Private Employees, said the list is not official. Despite that, certain locations listed, such as the Fuente de la Hispanidad in San Pedro and Paseo Colón, are popular protest areas. If it’s a highly transited area, chances are good there will be a protest or roadblock there tomorrow. Taxi drivers have also joined the strike, increasing the chances for and potential number of roadblocks. Hospitals will stop delivering non-essential services. Appointments, outpatient treatment, and surgeries are all on hold during the strike. Emergency rooms will remain open and critical surgeries will continue. While every public sector union has joined the strike, government agencies have assured citizens that basic services will keep running. ICE, INCOFER, IMAS, RECOPE and INCOP have all issued press releases saying their services will continue as scheduled. A spokesman for the immigration department said all borders and airports will be fully staffed and operating normally. If you do have a flight, we recommend leaving for the airport early in case you encounter roadblocks. The unions have called for an indefinite strike until the tax reform law is defeated. President Carlos Alvarado called for the unions to put off the strike and proposed a meeting on Monday instead, but the unions declined. The unions proposed their own tax reform law, but the government turned that down as well. Protests in Costa Rica rarely turn violent. 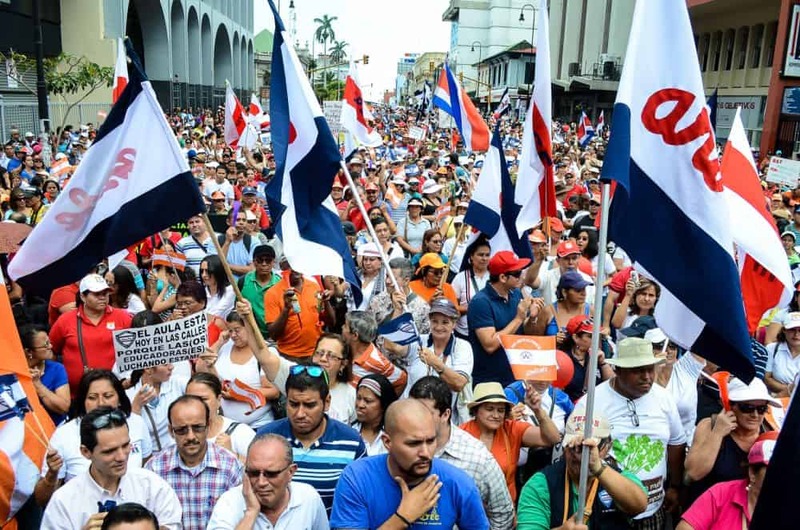 The xenophobic march against immigration that culminated with clashes between Costa Ricans and Nicaraguans at La Merced Park two weeks ago was an exception. Despite dozens of arrests, no one was seriously injured during the protests. While police expect this protest to remain peaceful, they say they are determined to keep the country free of roadblocks, a goal of protesters. Police officials have stated they are ready to deploy riot police to any part of the country. Where can I stay updated? We’ll be at La Merced Park at 10 a.m. to bring you live coverage from the strike there. You can also follow the #HuelgaCR hashtag on Twitter. Why are they opposing tax reform and what do they want? Unions are opposing Law 20.580, Strengthening of Public Finances, because they say it puts the burden on the working class while benefiting the country’s large industries. According to Semanario Universidad, the proposed law contains four key parts. The most substantial is the plan to replace the country’s sales tax with a value added tax (VAT). It would remain at 13 percent, but allow the government to collect taxes on services, a growing industry in Costa Rica, rather than just sales. Some services, like medical and educational services, would have a reduced 4 percent rate while some, like zonas francas, or tax-free zones where large international corporations operate, will still be exempt. The reform would increase food items in the market basket by 1 percent and there are proposed cuts to public universities. The proposed law would also affect income tax. It would add higher brackets for top earners, and would limit government spending on new projects. Read the proposed tax reform law here. Costa Rica finished 2017 with a deficit of 6.2 percent. The Central Bank of Costa Rica (BCCR) warned it could grow to 7.2 percent this year and country’s economy could plunge without significant tax reform. Correction: An earlier version of this article stated that the tax reform would affect payroll tax, it affects the income tax. It also stated that it would increase the market basket by 2 percent, it will increase food items in the basket by 1 percent, and the rest of the market basket by 2 percent.